Arturo J. Mota and his wife Nora are raising three children, Victoria, Vivian, and Arturo Michael. They are active members of St. Charles Borromeo Church. Arturo has a Bachelor’s and Master’s Degree from Chicago State University. He is employed as a Metra Railroad Rules Examiner. 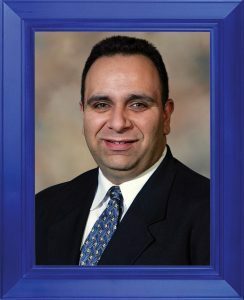 In July of 2002, Arturo was appointed Trustee for the Village of Melrose Park. In 2008, he was appointed Commissioner to the Proviso Township Mental Health Commission and served as its Treasurer. Arturo’s input was instrumental to the success of the Neighborhood Stabilization Program that allows homebuyers the opportunity to purchase foreclosed homes in Melrose Park. He also has been busy promoting the Proviso Township Prescription Medication Program, which has saved residents thousands of dollars. Arturo has been serving as co-chair of the annual Child Health Fair Day and Back to School activities. This event gives local agencies the opportunity to provide knowledge on various topics to inquiring residents. Most important, this event has provided children with thousands of free immunizations, dental exams, and vision tests. In addition, more than 2,000 school backpacks have been handed out. To appreciate Arturo’s commitment to his neighbors one only needs to understand the case of Melrose Park resident Jorge A. Mariscal. Jorge was in dire need of a kidney transplant but didn’t have health insurance. Arturo spearheaded a campaign for him, raising both funds and kidney transplant awareness. On December 6, 2012, thanks to Arturo’s hard work, Jorge’s dream came true when his mother became Jorge’s kidney donor. Arturo still wears the green wristband symbolizing the Donate Life program. Arturo’s generosity, constant effort, and continued commitment to the Melrose Park community, has brought him the recognition of the Chicago Fire, Chicago State University, Centro de Salud, Jarritos Soft Drink, and Latinos Unidos con Voz (LUV).